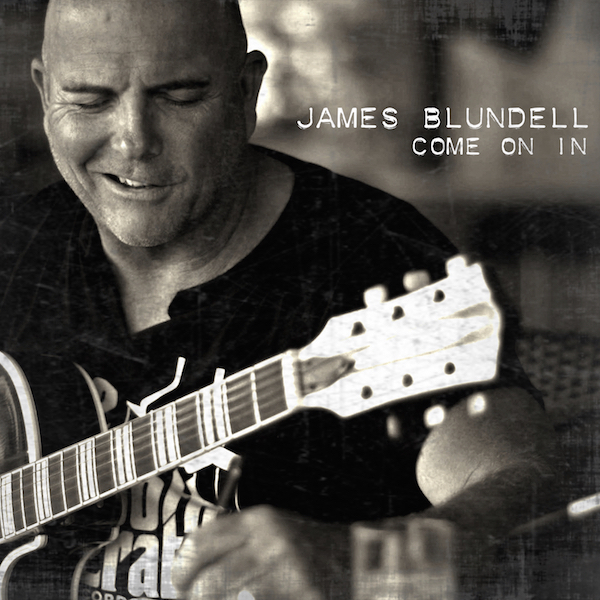 After four years without an album, James Blundell has certainly made his fans’ wait worthwhile with the release of the excellent Come On In. I spoke to James a week or so ago, just after he’d finished a long run playing at the Brisbane Ekka. Congratulations on the album, which I’ve so enjoyed listening to. It sounds like all the tracks belong there, if that makes sense. It makes me think you must have discarded a few along the way, because you really have got the balance right. All the songs sound like they’re in the right place. I cannot tell you how much I appreciate that comment, because it’s exactly what we were trying to do. Karen Waters, who I’ve worked with – who is Red Rebel Music – is a really, really amazing music person. I just love how she views it. That’s actually the point of the album. We had a lot of songs to choose from initially – it was just going to be a series of solo acoustic singer-songwriter tracks. So we started work on that and I was sending acoustic demos through to Karen and she said, ‘Well, how many more of these have you got?’ and I said, ‘How many do you want?’ That was how the song selection started and it was a fairly healthy way to do it rather than as an artist having a collection of songs that I was very protective of and said, ‘This is the album’. Which I’ve never actually done to that degree but there’s always a focus on what the collection of songs is, what your shortlist is. And we just kept adding them up. We actually started work on the album in September last year. It got to the stage where we were having so much fun with it that Karen said, ‘We really ought to wrap this up and master it’. And that’s about how much hard thought and blood and sweat went into it. It was a very, very enjoyable experience. I wasn’t in the same room as any of the musicians and the producers. Did that seem like a weird thing initially given how you’re used to working in the past? I’ve always believed that being in the same room as the band comes down to that interaction. But what happened this time round was that I would deliver the vocal acoustic demo. The first two tracks went to Theo Posthumus in Canada who’s never met me – we’ve never even Skyped. We were planning to do that but it was working well just sending the music back and forth. Then Karen engaged Nick Howard in Sydney and, again, we never even got face to face on screen but what I found was that because I wasn’t in the same room as those people all the time, you don’t try to influence them. James Gillard, a wonderful bass player, when he’s working on album he says there should be a thing called an Artist Alert – when the artist comes into the room the objectivity flies out the window [laughs]. I’ve been meaning to call him and tell him that I think he’s dead right because not being there to say to the producer while he’s trying to do something, ‘Oh, I don’t like that, that’s uncomfortable’ – you don’t get that choice. What happens when the file comes back to you is that you open it up and rather than being confrontational it’s like, ‘I never thought of doing it that way’, which opens up a completely different interpretation to it. I found it very, very invigorating and really, really enjoyable, and particularly because most of the two places I recorded were in my bus and in the spare room of the shearers’ quarters that I’ve just renovated at home. And one night I set myself up – I was absolutely sure I was good to go for vocals and it just didn’t happen. I don’t know why – I just couldn’t get into it. So I left everything set up, got up at half past five in the morning, put my dressing gown on. I didn’t have to drive through traffic, I didn’t have to park my car – it was just all there and good to go. I was making some notes as you were talking about sending off that demo, and those notes were along the lines of how much trust you had to have with the people you were working with, how detached you had to be from the outcome of what they would do with it, how vulnerable it actually made you, in some ways – and that’s a strength, that vulnerability – but also how much you had to rely on your instinct in terms of who to work with and what was going to happen. I think in hindsight the two pivotal parts were that I’d already developed a very high level of trust in Karen to begin with in the conversations we’d had prior to even starting work – I just thought, I really like how this woman sees music– and the first interactions with Theo from Canada were so refreshing and exciting. I’ve always been very experimental in my music – I think that’s vitally important, you’ve just got to stay open to it as an art form, you just can’t say, ‘This is my sound and I’m going to do it this way forever and a day’, because you’d be boring yourself in a heartbeat. So letting go of everything and just being the singer was wonderful – I had an absolute ball. Quite often when I’ve worked closely with producers there’s been quite a lot of … Of course it’s not interference, they’re producers, that’s what they’re there to do. But you can wind up in a reasonably confrontational situation talking about even fine tuning, and that didn’t happen because we weren’t in the same space to argue. It was great. In terms of not stagnating with your music: these are risks and for a lot of artists, the deeper they get into a successful career, the harder it is to take those risks, because of course what you’ve been doing has been working so why would you risk anything else. But it sounds like for you the fire of creativity is very much alight – it’s something that you’ve always had. I’ll be purring if you keep that up – that’s exactly right [laughs]. I seem to be incapable of living a normal domestic life but I’ve never been more stable creatively. I’ve been blessed in so many ways to have a very colourful and challenging life, and there’s just more and more to write about and have an observation about. I was saying to some young people I was working with at the Brisbane Show, ‘The beauty of this is that as a writer getting older is one of the few things where it’s a benefit rather than a negative because the palette gets richer and richer. You were saying before about letting go and it is all about trust. As I said, I had a high level of trust in Karen before I started, instantly liked what the first producer did and am now an avid fan of Nick Howard’s. I’m trying hard not to get myself completely sold on just sending him the next three songs for the next album. Part of this process that I’ve enjoyed so much is not knowing what was coming next and that was very stimulating. Because you sit within the country music genre and your fans are within that genre that is, as far as I can tell, the one musical genre in Australia where the audience doesn’t necessarily expect you to turn up and do the same thing every time. If they like you, they like you and they’re open to whatever you can bring. I think that’s a really relevant observation and that has changed in that I was considered the heretic of the genre for a really long time. At the end of the Slim Dusty, Smoky Dawson, Buddy Williams thing I came in from the angle of [Kris] Kristofferson, Steve Earle and Willie Nelson, Springsteen and Mellencamp and all those rockers – The Eagles – all of those things were part of my background. Now I can see a broad range of good young artists who are not afraid to use their influences. I was talking to some young blokes this Saturday just gone and I was asking them if they had to do a three-song set – an original and two covers – what covers would they choose and why. One of them chose a Nine Inch Nails song. It was just really good to see that they’re not genre bound. And I also believe very strongly that once the public got the ability to divide a track at a time and compile their own playlists, I suddenly had heated conversations with record companies – I walked out on my contract saying, ‘You can’t sanitise the process of music – you have no idea what people are going to like.’ Because when they download ten tracks they’ll have Kylie Minogue beside Jim Morrison and the Doors and that’s the nature of music – people just like the song. What you put your finger firmly on is that the loyalty of the patron of the country music genre is that they then support the artist and in a way I think they expect them to do different things. Slim Dusty, all of a sudden the guy’s done an album about Star Trek, and rather than be vilified for it, it was embraced and one of his biggest sellers, and I think that was a very fair illustration. And something else that I meant to touch on before – I grew up in 1964 and probably started to consume music in the late ’60s, and there was no genre classification then. I was having arguments early on with the traditional record industry, they were saying, ‘You’ve got to define your sound’. Well, The Beatles never did, Elton John never did. The people I loved never did. I don’t see why it’s essential. And at the risk of, as my nephew says, covered in a cloud of smoke, I think it’s been borne out because the public are just interested in the songs they like; the rest of it is all the industry trying to second guess itself. Before when you were talking about being a heretic I was thinking what probably most branded you a heretic was that you recorded a song with that nice young man from Australian Crawl. That’s right [laughs]. ‘How dare you! How dare you let them!’ And, completely objectively, the rest was history. That was an amazing period of time that I wouldn’t swap for all the rice in China. I learnt a great deal from it. On to the songs from this current album, I was listening to ‘Hills of Brisbane’ and it made me want to visit, and I wondered if Tourism Queensland have been on to you yet. No, no, but we’re going to approach them if they don’t call soon [laughs]. I’m being very silly, but funnily enough I’ve just done the last ten days at the Exhibition [the Ekka] and the bloke who I’m lucky enough to play drums with when I can afford him is driving me home, and we actually got lost – well, not lost, there was a choice of three roads and I picked the wrong one, and I’m a local, I should have known better. But we drove through all the country that that lyric and the song, about ‘struggling home’. It’s a beautiful city. I love Brisbane and I’ve defended its virtues and its reputation since I was a teenager. That’s why it was such an easy song, in a way, to write but, that said, it also took me seven years to get it right. That’s the nature of craft, I guess. That’s right. And I’m finding now writing any amount of new material that I’m going right back into some of the stuff that I discarded years ago because I’d have the idea but couldn’t figure out what to do with it. That’s a real pleasure, going back into the treasure trove. So it sounds like even though it’s been four years between your last album and this one, there may be something else fairly soon. You have a lot of material. You’re way too astute. Karen and I have already spoken about the fact that when I had my own boutique label I was trying to find a way to get some of the young artists I loved through the roadblock, the machinery that the traditional industry used to be. I said to them all, ‘We’re not going to be working on an album-by-album basis. We’ll go in three or four times a year, record and track your progress as you evolve as musicians. And your albums will subsequently become a collection of the four or five songs you’ve released plus four or five new ones.’ So when someone goes to spend $19 or $17 online or whatever it is, it’s a bit like a guarantee – they know they’re going to enjoy at least half of it, rather than buy a $20 for one song and hate the other nine. It also goes back to a thing – one of my favourite albums of all time is Yellow Brick Road [by Elton John]. Bernie Taupin was in American and Elton John was in England and that was [written] by fax machine and charts. That’s clever and it sort of illustrates the points we’ve been making, that music is much more than just sitting down and trying to write hit songs. Come On In is out now through Red Rebel Music and Revenge Records.